In a world first, the residents of Urumqi, the capital of China’s Xinjiang region, are required to ­install on their smart phones a new app that automatically ­deletes any material deemed ­subversive. CleanWebGuard is part of a wave of pioneering monitoring technology being developed through massive government funding. It is also part of a suite of new controls on the 10 million Uighurs in the vast region in China’s northwest, about the size of NSW and South Australia together. The Uighurs, the original ­inhabitants, are mostly Muslim and of Turkic ancestry. Since China’s Qing dynasty reconque­red the region in 1884, there have been frequent attempts to secure greater autonomy and even independence. The city government says the new app locates video or audio containing “terrorist content” or ­“illegal” religious material, ­images, e-books or documents, and deletes them automatically. It can be installed within ­seconds, by applying a barcode widely used in China today and which is being posted in all public venues. A technology company affil­i­ated with the municipal police ­department has developed this app “to target people, materials and thinking for clean-up work, management and crackdowns”, a city statement said. Police have been equipped with handsets that can instantly inspect whether smart phones contain the required apps. Uighurs are, in many parts of the region, required to lodge their passports with the local public ­security bureau. They often report difficulty in buying rail or air tickets within China, or booking hotels. Vehicles owned by Uighurs are required to install GPS devices without which they may be ­refused fuel. Under new regional legisla­t­ion, women wearing hijabs or oth­er Muslim-associated garments and men with “abnormal” beards are banned from public ­venues such as bus stations, and aren’t ­allowed to board trains or aeroplanes. Children with religious names — such as Mohammed, Jihad, Arafat, Quran, Halal, Haj or Mecca — are not allowed to be registered, and thus cannot attend schools or clinics. Refusal to watch state TV is also now an offence in Xinjiang. At least one county requires all tools with blades — including kitchen, fruit and butchers’ knives, and tailors’ scissors — to be engraved with the real name of the owner, who must pay 50c for each. In some areas, all ethnic ­“minorities”, including Uighurs, must attend daily flag-raising ­ceremonies and playing of the ­national anthem. 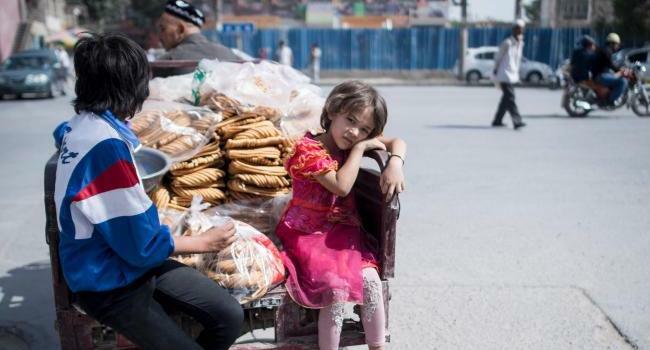 The World Uighur Congress, an exile body, claimed that during the fasting month of Ramadan, teachers and other public servants were instructed to eat in the middle­ of the day, and restaurants were ordered to remain open. Xinjiang expert James Leibold, an associate professor in politics and Asian studies at La Trobe University, told The Weekend Australian that control mechanisms had been considerably tightened since Tibet communist party secretary Chen Quanguo was transferred to Xinjiang. He said the new app signals the authorities’ attempts to draw on new hi-tech forms of surveillance and self-monitoring, including experimenting with face and iris recognition technologies, tracking of cars, the use of robots and drones, and DNA profiling, in the name of countering the “three evils of extremism, terrorism and splittism”. The result was an “increasingly sophisticated police state”, where most ordinary Uighurs, and many ethnic Han Chinese residents as well, feel under siege with fewer spaces for autonomous action and even thought. He said this surveillance increas­es the embattled Uighur minority’s sense of cultural insecurity, driving a deeper wedge of resentment and mistrust between itself and the Han majority and undermining the regime’s stated goal of creating harmonious ethnic relations. Some people in Chinese coastal cities are making billions by designing­, selling and installing hi-tech security technologies in what Tom Cliff of the Australian National University calls the “lucrative­ chaos” that is the Xinjiang political economy.